I refer specifically to coils on 1980's 4 strokes. One has to check both primary and secondary windings. It is the secondary that always stumps me as I never get the readings informed i should. This on perfectly working ones for thousands of miles! This is simple bridging the two contacts with the lowest setting on the multimeter for resistance, 200ohms setting. 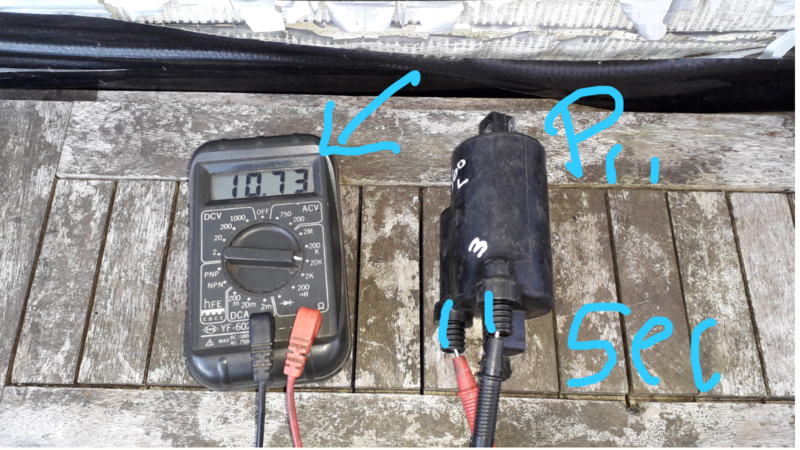 A result of 3.5-5 Is thought ok.
One I am told connects the multimeter at 20k ohms setting to the primary side and one to the plug cap contact. This should display between 10-20k ohms. On most of my fully functioning bikes , ones I have ridden round Europe the result is "1". I.e total resistance. it works fine ? It is the wrong reading ? On all my bikes I have that reading and they work fine ? When the test says they are bust? If however I test by bridging both of the secondary side contacts on that very coil I get a normal reading - 10-20k. Are coils in some way different and thus need testing in another way ? I at one time bought some brand new coils and they out of the box tested the same , secondary "1" resistance ! Any electrical wizz's help explain this ? I attach a pic of a coil that shows the pictured results bridging both secondary terminals @ 20k mm setting. It shows "1" when connecting primary and secondary . 1981 KZ650-H1 CSR with stock electronic ignition. secondary resistance >>> 12k to 18k ohms. note: the readings listed in the manual are for a Kawasaki tester. supposedly, any other meter can give different results & there is no way to know if the readings are good or not. Using a VC97 digital multimeter. Actual readings of used OEM coil that I removed from the motorcycle a while ago. secondary resistance >>> spark plug wires removed = 12.25k ohms. secondary resistance >>> spark plug wires installed but spark plug caps removed = 12.44k ohms. note: with the spark plug caps installed, I was not getting any reading. Also for some tests, it can be handy to use an analog meter to see if the needle sweeps. 1981 KZ650-CSR. Competition, Sports & Road. Last edited by martin-csr; 02-12-2018 at 10:13 AM. All good info but how to test ? A) connect as in any you tube video from primary to secondary ? Plug Cap , jump lead whatever on ? This method works on none of my stock coils even new ones in the shop !!!!!! B) as on mine bridge the two secondary terminals ? Which seems to give the right reading? The issue is with option a) I get "1" on mm. Meaning total resistance . This on perfectly working coils. WHY? I have never known why . I do not know what sort of reading, if any, you should get when testing between 1 primary terminal & 1 secondary terminal. The Kawasaki service manual does not say to do that. The primary resistance is checked with the meter leads touching the 2 primary terminals. The secondary resistance is checked with the meter leads touching the 2 secondary terminals as shown in your photo. The manual shows the secondary resistance being checked at the spark plug wire ends with the spark plug caps removed. Common sense coil check. Ride the motorcycle at high speed, then stop & feel the coils --- press firmly with your fingers: they should be warm, not hot. Mine tested fine cold, but after riding they were very hot to the touch, so I installed the green Dyna 3.0 ohm coils. Hot indicates that there are internal shorts or winding breakdown or something like that. The windings can become old & oxidized over time, as can the spark plug wires & connections. That is just the way the coils are wired internally. It explains why my coils are fine!! And run on my bikes! But they tested wrong as I was doing the wrong test. I have never known the answer to that ! I am ready to test again with any advice.